AutoMuseum Volkswagen is the official museum of the Volkswagen brand in Wolfsburg. It is a great visit, quite different from the nearby glitzy VW Autostadt. At the Volkswagen Museum, the historic cars rather than the branding and PR are the stars. The Volkswagen Museum is separate from Autostadt (and its ZeitHaus car museum) but in close proximity making it easy to visit both on the same day. Fans of classic Volkswagen cars may find a visit to the museum not only cheaper than Autostadt but more rewarding too. The AutoMuseum Volkswagen is the official museum of the VW brand in Wolfsburg. Although restructured in 2007, it remains a traditional car museum where the vehicles are the main attraction without slick public relations and style-over-substance designs. 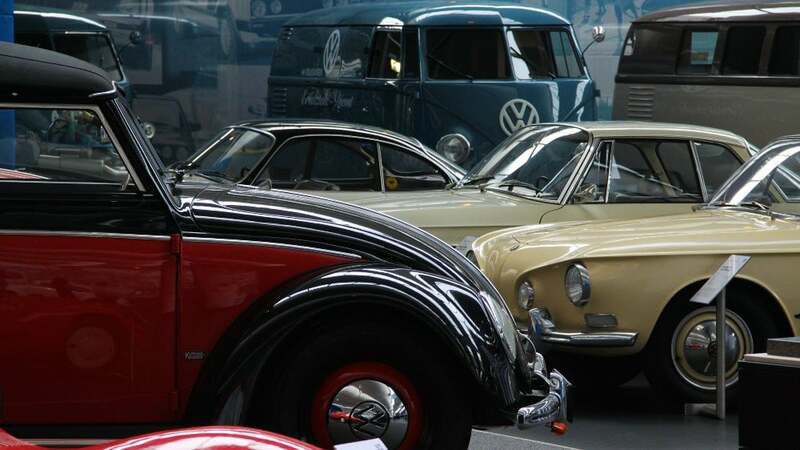 The Volkswagen Museum has around 130 cars on permanent display ranging from the earliest VW Beetles to design studies. The main themes are the VW Beetle, the Golf generation, Transporter (micro bus), and design studies. Further temporary exhibitions enhance the permanent displays – currently celebrating 40 years of the Polo. Descriptions are quite cryptic – often only in German – allowing visitors to focus on the cars themselves. For around three decades, the VW Beetle and air-cooled engines were the hallmark of Volkswagen. It is thus no surprise that most of the cars on display are in the air-cooled engine category. Volkswagen only introduced water-cooled engines to its main products during the 1970s. Many of these cars on display are more current making the design studies, special conversions, and record-breaking vehicles more interesting than the production models on display. The AutoMuseum Volkswagen labels itself as the Treasury of the Brand (Schatzkammer der Marke). The ZeitHaus in Autostadt may have claimed the last air-cooled Beetle produced, but the museum here has many of the other significant record-breaking models. Many of VW’s other air-cooled cars are also on display with the Transporter (micro bus) getting the most attention. These Transports – currently in its sixth generation – have been a mainstay of the German light commercial transportation and leisure markets since the 1950s. In many parts of the world the VW Bus are referred as the Combi, although Kombi in German means a station wagon (estate) of any car brand. VW clung to the increasingly uncompetitive air-cooled, rear-engine cars for far too long, nearly causing the demise of the company like so many other German carmakers in the 1960s and early 1970s. The museum has several cars on display that were designed to be the new water-cooled generation of Volkswagen cars. These VW designs were mostly rejected and the Passat and Polo based on Audi cars. Ultimately, it was the Golf that saved the brand and it remains the mainstay of the Volkswagen motor manufacturing concern 40 years on. In Germany, the VW Golf has been the best-selling car model every calendar year since 1981. A few record-breaking or special Golfs and other water-cooled production cars are on display but the special conversions and motor-sport models are more interesting. What happens to futuristic design studies after the motor shows? After a while, they get long in the tooth and VW shifts some off to the Auto Museum. Visitors may recall many of these studies from the 1980s and 1990s. Some withstood the test of time while others are less futuristic now that the future has arrived. The AutoMuseum Volkswagen, Dieselstraße 35, 38446 Wolfsburg, is only a short drive from the Autostadt and Wolfsburg train station. Ample free parking is available – this lovely museum attracts far fewer visitors than glitzy Autostadt. Opening hours are Tuesday to Sunday from 10 am to 5 pm. The museum is closed from December 24 to January 1. Admission is €6 for adults, €3 for children and pensioners, or €15 will get the whole family in. Seeing the Auto Museum Volkswagen combines easily with a visit to Autostadt. It is also close to the Wolfsburg Designer Outlets to end the day with some savings and discount shopping. For other German car manufacturer auto museums, it is necessary to travel to Southern Germany where BMW, Mercedes, Porsche and Audi have their head offices and fantastic marque museums. More photos of the AutoMuseum Volkswagen on Flickr.